There are many options to jot notes down on the iPhone as well to keep ToDo lists. I find that I have much of my quick notes spread out amongst many apps. This causes problems trying to make sure I use the right app for the right project and that I check that app later. In an attempt to get everything in one place across my iPhone, iPad and notebook, I have been playing around with the free cloud notes system, Evernote. An app I have been playing with over the last week, ShotMemo is helping with that process rethink. 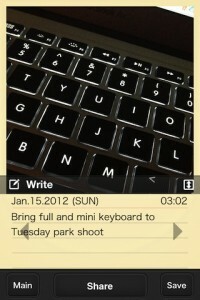 ShotMemo let me take a quick photo, resize it, add a bit of text and send it to my Evernote account. Super quick! ShotMemo does have a lot of fine tuning features too for those times it’s more about appearance or more info is needed. You can choose to have the date/time auto inserted into the note. As well, Geo location can be auto entered. The background of ShotMemo’s notes area (resizable) can be changed to any of the 16 (I actually counted 17, but the dev says 16) options. If that isn’t enough, there is the option to in-app purchase 23 more. When you have your shot and text, then choose to send, you have the option of the size of the image… which is handy when there is only slow internet available. Sending to has more options than just Evernote, you can also choose to attach the image/text to a email, or share through Twitter, Facebook, Tumblr and Flickr. In the case of Evernote, the last screen gives you the option of which folder you want the note sent to. So, while I say ShotMemo is super fast to get a photo and note to my Evernote account, there are tuning options that can stretch the sending out a bit. It all comes down to what you need at that time.